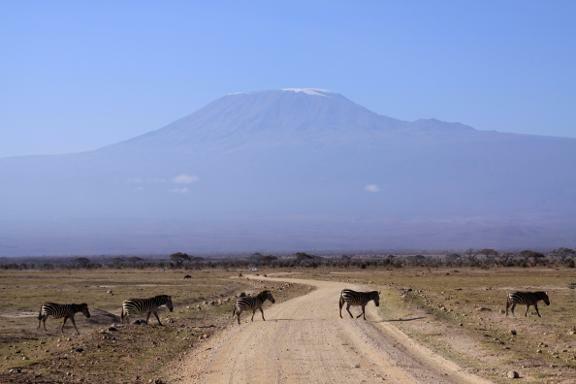 At the gate to Amboseli, some Maasai women were selling trinkets and jewelry. Chris had warned us that their sales pitch was very aggressive, so we kept our windows closed. Very charismatic, and I'm sorry that I did not negotiate a price for taking a picture. After passing through the gate, we saw a giraffe munching on some trees, then came the lake. 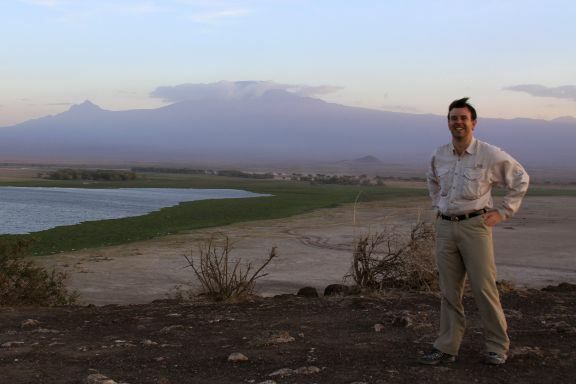 In the rainy season, its depth normally reaches a few inches or more, but we found out that there has been no rain here for the last three years. For half an hour or so, we sped across the dry lake bed, dust blowing across and nothing to see. On arriving at the little oasis surrounding our hotel, we quickly spotted our neighbors. 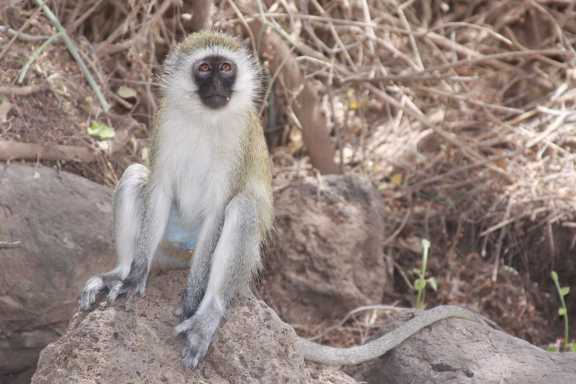 Very cute vervet monkeys, we were warned that they are thieves! Leave your doors or windows open and they will ransack your room and steal not just food but just about anything. As I walked out to join a game drive at dawn, one monkey was sitting on a patio chair. She crossed the path a few feet in front of me and went through the open door to the dining hall. As the staff was busy preparing breakfast, I knew a big commotion was coming! 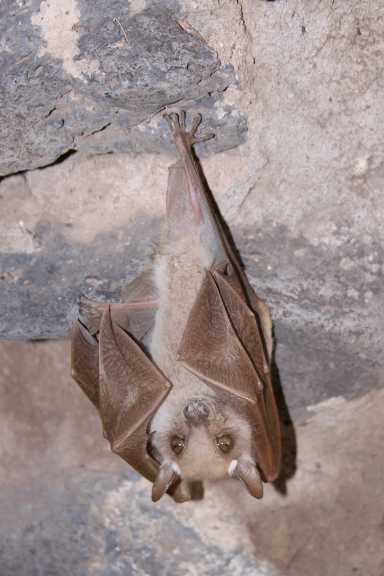 This sleepy fella was hanging upside-down on the rock wall next to our land rover, and stayed there all day. Our guide, Chris, picked him up by his feet and moved him to a shady spot. It's hard to judge his size in this shot, but his splayed toes spanned Chis' finger, and the whole bat was considerably larger than his hand. 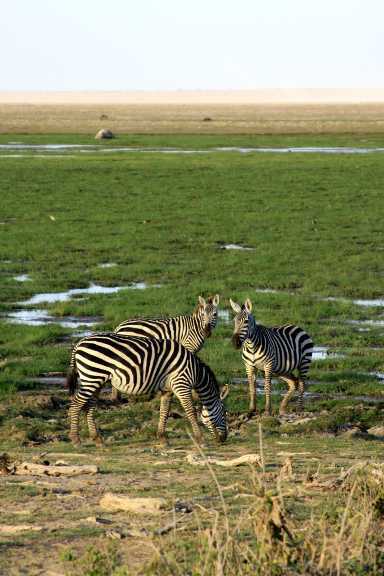 Among the first animals we saw in Amboseli were zebras - lots of zebras. 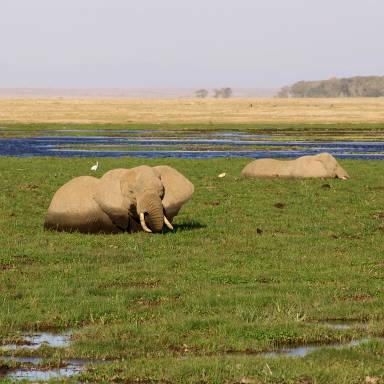 Behind these three is the reason why animals come to Amboseli, the swamp fed by an aquifer underground. Most of the elephants were two-tone: dusty and pale above, clean and dark below. They prefer the cool water during the heat of the day. We stopped to watch three warthogs at the treeline. They would stand perfectly still for a few seconds, then all three would suddenly run a few feet only to stop in unison and stand still again. Why should such a beautiful animal act so strangely? Suddenly the trees parted and this giant stepped out. At the same time, our warthogs vanished into the underbrush. To find the animals you cannot see, watch the behavior of those you can - a very useful lesson. 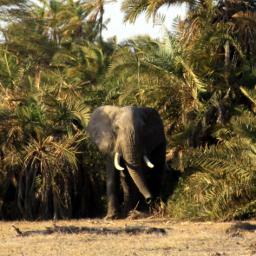 After eating trees for a while, the elephant headed out towards us, and other land rovers came to watch. In the distance, we saw that he was big but as he got closer, he was huge. 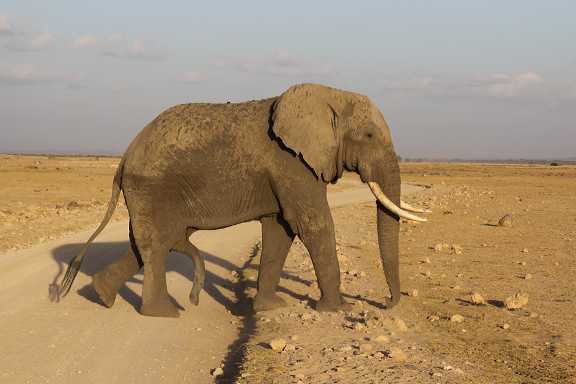 A bull, or five-legged elephant, crossed the road just a few feet in front of us. 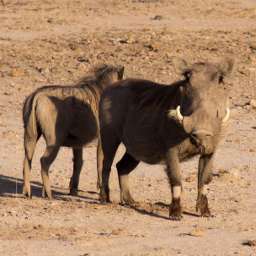 Earlier, I mention the beauty of warthogs. Why beautiful? 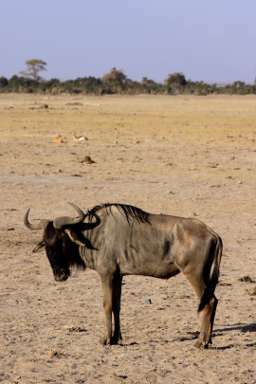 Once you've seen a wildebeest, you'll understand the beauty of warthogs. In the distance behind this wildebeest are a couple of Thompson's gazelles. On the left, Thompson's gazelle. Below, Grant's gazelle. Thompson's are very small, and run very fast. One day, we saw a baby Thompson's running around his family group - really fun to watch. 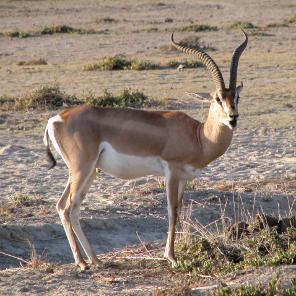 Grant's gazelles are much larger, and similar to impalas. 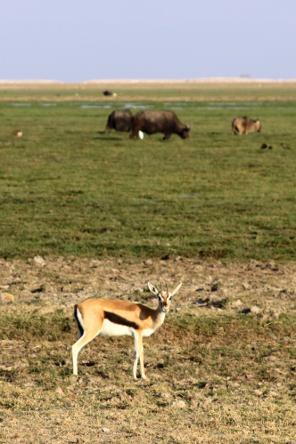 The crew in another rover saw the third kind of gazelle on our way out of Amboseli. Called a geranuk, these are long necked browsers, where the other gazelles are grazers. Gary Fitzgerald, another in our tour group, took the Grant's photo. Thanks, Gary! There are three kinds of giraffe in Kenya. 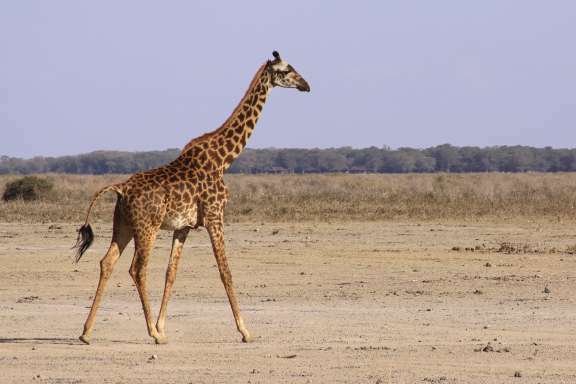 This Maasai giraffe was striding across the desert and crossed the road right in front of our rover. Onesmus told us that giraffes are very gentle. This was certainly true when later we met Laura the giraffe. She was a lot of fun! We saw plenty of birds, but I don't know what kind this is. 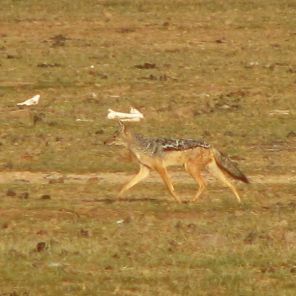 Jackals were an occasional sighting, and they seemed shy. They kept their distance from our vehicles, and this shot of Gary's is better than any of mine. 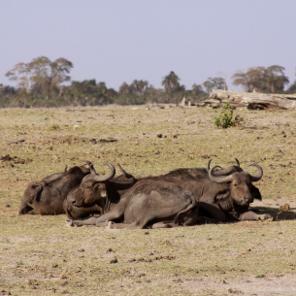 Cape buffalo kill more people than any other animnal in Kenya. Very aggressive defending their territories, they even work together to fend off lions. We kept our distance. Though wonderful to see in the wild, the big attractions on safari are not giraffes and elephants. Everyone wants to see the predators. 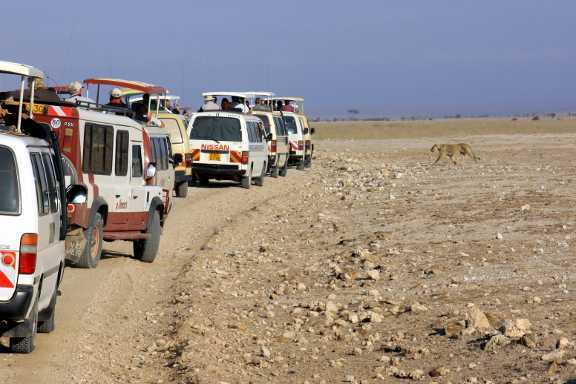 When the radio announces a sighting, every land rover speeds toward it. Here was a pack of lions, walking slowly across the desert one by one. 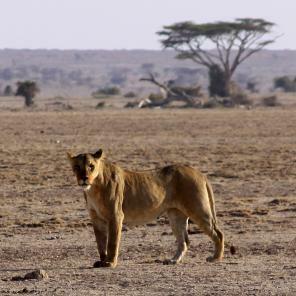 As the first lioness crossed the road, she seemed to run at the land rovers. Our driver, Onesmus, thought she was a little upset with all of us. In such a severe drought, dead animals litter the place. Most were old carcasses already dried out, some just bones. Others were more recent, and most were zebras. Apparently, all the proper zebra food had been eaten long ago, offering the animals a choice between thirst or a kind of hidden malnutrition. 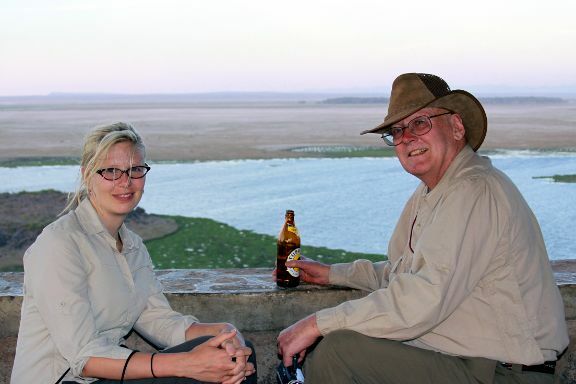 Our last night in Amboseli, Chris packed a cooler of drinks and took us to a hill overlooking the swamp. From there we watched the animals, the sunset and ant lions. Above, my sister Christina and uncle Jerry. Christina shot me with the wind in my hair. A long line of zebras crossing our road just before reaching our hotel. 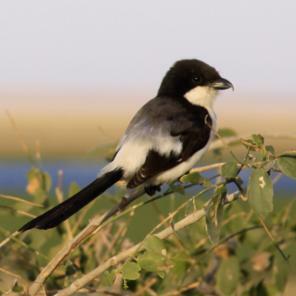 We'll soon meet them again in the Maasai Mara, which is the Kenya part of the Serengetti.